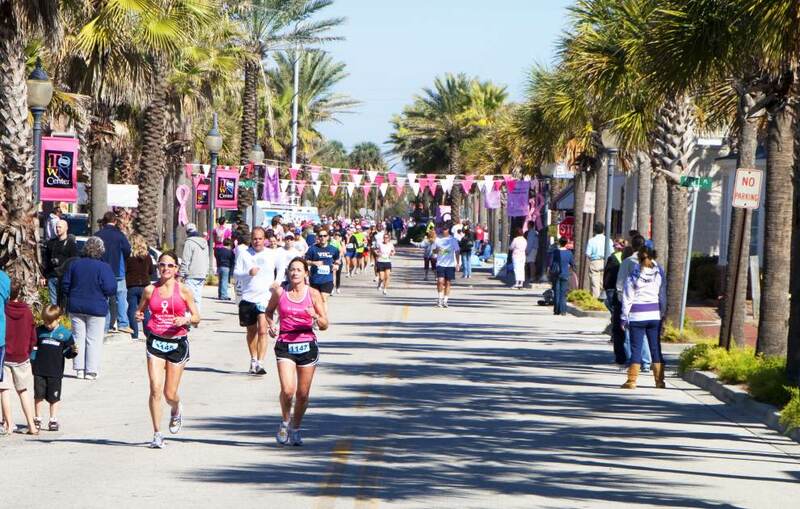 Deck out in your pink-est race gear for The DONNA Marathon to Finish Breast Cancer February in Jax. CNN Travel has ranked the DONNA Marathon as one of the “Seven Marathons Worth the Trip” and Women’s Running Magazine has named the event a “Favorite Charity Race”. Hosted right here in Jax, the DONNA Marathon is the only marathon in the nation 100 percent dedicated to raising funds for breast cancer research. In 2008, philanthropist, journalist and marathoner, Donna Deegan, created 26.2 with DONNA, The National Marathon to Finish Breast Cancer. The DONNA Foundation, acts as the host organization of the DONNA Marathon and works to raise funds to financially support breast cancer patients. The race makes it easy for participants and spectators to fundraise for the cause by either running the race or sharing the word to acquire potential donors. DONNA Marathon Weekend, which is held the second weekend of February each year in Jacksonville, brings 10,000 local and international participants into the city. This Boston-Qualifying marathon offers a scenic route and large crowd support. DONNA Marathon Weekend hosts race events for athletes of all levels, including a 5K, 10K, Half Marathon, Marathon and Marathon Relay. The marathon course takes runners from TPC Sawgrass, through four of Jacksonville’s beautiful beach communities, with water stations at every mile, and historically perfect race day temps (averaging 55 degrees), and finishes at Mayo Clinic. With oaked lined shaded streets in Atlantic Beach, beautiful ocean views in Jacksonville Beach, community support throughout the beautiful streets of Neptune Beach, you’ll want to experience the beauty of Jacksonville at this race. To register for the race, or for more information about race weekend, visit breastcancermarathon.com. During race weekend, participants and fans can partake in a host of race events from Friday to Sunday. 8:00 a.m. | Social Shakeout Run: 3 mile Run/Walk with Donna Deegan, DONNA Special Guests and VIPinks. This event is FREE and open to the public. Noon-7:00 p.m. | DONNA Expo: Visit exhibitors featuring apparel, fitness gear, samples and giveaways. This is also site of on-site registration and packet pick-up available during expo. Expo is FREE and open to the public, with FREE parking. 5-7:00 p.m. | DONNA VIP Reception: Sponsors, top fundraises and specials guests kick off race weekend at this VIP reception and cocktail party. Times Vary | Mayo Clinic Advances in Breast Cancer Management 2018: Overview of the most recent advances in breast cancer research and clinical care. Learn more about Friday, February 9th race events here. 8:00 a.m. | DONNA 10K Presented by Beard’s Jewelry: Race through the streets of Downtown Jacksonville. 10:00 a.m. | DONNA 5K and Family Fun Run Presented by Jaguars Foundation and AXA: Race through the streets of Downtown Jacksonville. 8-4:00 p.m. | DONNA Expo: Visit exhibitors featuring apparael, fitness gear, samples and giveaways. This is also site of on-site registration and packet pick-up available during expo. Expo is FREE and open to the public, with FREE parking. 7:30 a.m. | DONNA 110 Ultra Marathon: Athletes cover 110 miles through the night in Atlantic Beach. Feel free to cheer these participants on through the night! 5:30 p.m. | Fundraiser Dinner with Donna and Mayo Clinic: Honoring top fundraisers at an invitation-only dinner. Learn more about Saturday, February 10th race events here. 7:30 a.m. | 26.2 with DONNA National Marathon, Half Marathon and Marathon Relay: Participate or support runners throughout the full and half marathons and marathon relay. 8-3:00 p.m. | DONNA Post Race Party: Celebrate at Runners’ Village at Mayo Clinic. 10:00 a.m. | Half Marathon Awards Ceremony: Celebrate at Runners’ Village at Mayo Clinic. 12:00 p.m. | Marathon Awards Ceremony: Celebrate at Runners’ Village at Mayo Clinic. 10-10:00 p.m. | TacoLU Toasts Your Finish: Wear your medal for a free beer or glass of champs. Learn more about Sunday, February 11th race events here.